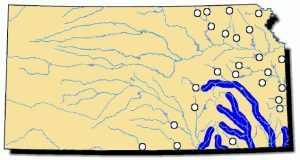 This species can be found in the entire upper Mississippi River drainage from northern Arkansas and Tennessee north to Minnesota and Wisconsin, and from New York west to eastern Kansas; as well as the Winnipeg, Red, and Nelson River systems of central Canada; Great Lakes- St. Lawrence system throughout except most of Lake Superior. It is considered stable througout the majority of its wide range. Comments: The plain pocketbook is relatively easy to identify because of its large umbos. 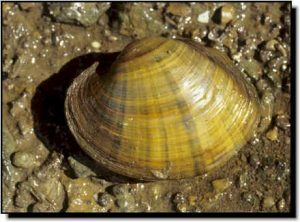 However, male and female mussels of this species are dimorphic, meaning their shapes differ. The female is more inflated as she requires more internal space to brood her eggs within gill pouches each year. The male is longer and more pointed at its posterior end than the female. See pages 10-11 for a detailed account of plain pocketbook reproduction. The plain pocketbook is widespread but is never found in high numbers at any site. One intact shell was found in a Pleistocene bank deposit where mammoth and ground sloth bones were also buried.